The victims of the Capital Gazette shooting — Rob Hiaasen, Rebecca Smith, Gerald Fischman, John McNamara and Wendi Winters — had worked at the Capital Gazette for anywhere from 26 years to eight months, in jobs ranging from sales assistant to editorial-page editor. Read more about them and what they meant to the paper. 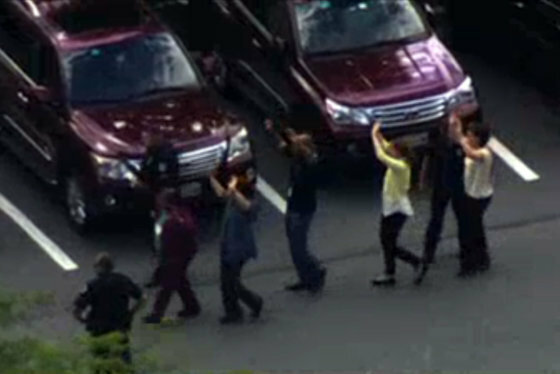 WASHINGTON — Five people were killed when a gunman targeted a Maryland newspaper Thursday. 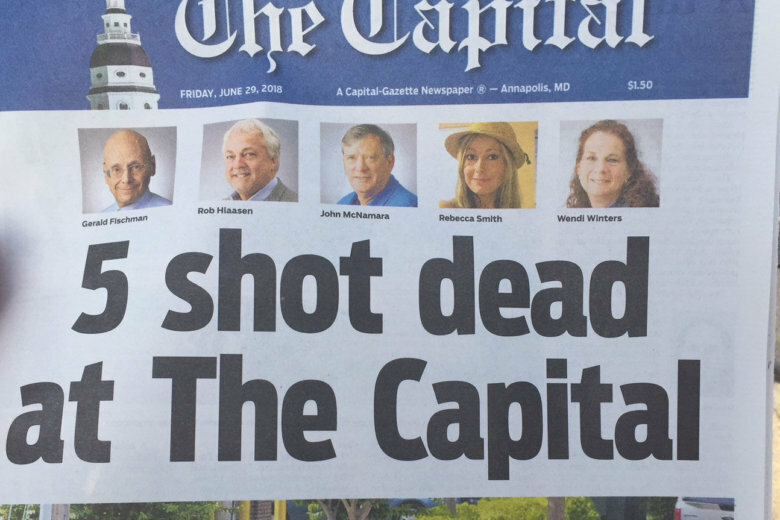 The victims — Rob Hiaasen, Rebecca Smith, Gerald Fischman, John McNamara and Wendi Winters — were all employees of the Capital Gazette, a newspaper published in Annapolis. Fischman and McNamara were graduates of the University of Maryland Philip Merrill College of Journalism; Hiaasen was an adjunct lecturer, the college said in a statement Thursday. Winters, 65, was the special publications editor who had a talent for “connecting with the community and documenting people’s achievements,” former Capital Gazette editor Leslie Hunt told the newspaper. Winters started at the paper as a freelance reporter in Maryland 20 years ago after a career in the fashion industry. She joined the Capital Gazette staff full time in 2013. “She was in many ways the best part of the newspaper in that she cared so much about the city,” former Capital Gazette editor Steve Gunn told The Associated Press. Robert Hiaasen’s death was first confirmed by his brother, author Carl Hiaasen. BREAKING: Author Carl Hiaasen says brother Rob, columnist and writer, among 5 killed in Maryland newspaper shooting. Those who knew the 59-year-old columnist and assistant editor, remember him for his “wryly observant writing style and his generous mentoring of young journalists,” Capital Gazette reported. A native of Florida, Hiaasen moved to Maryland in 1993. He has worked as a reporter for The Palm Beach Post in Florida and The Baltimore Sun. He became the assistant editor at the Capital Gazette in 2010. He was also an adjunct lecturer at the University of Maryland. In February 2017 he wrote about his impressions when he first moved to Maryland and his love of Berger cookies. His wife, Maria, told Capital Gazette that Hiaasen, who was 6 feet 5 inches, was a “giant not just in stature but in character,” and that he loved humor, journalism and helping young writers at the Gazette. In a brief phone call with The Associated Press, Carl Hiaasen said his family “was devastated beyond words” by the senseless killing of his brother at The Capital Gazette. Kelli Peleska told Capital Gazette that Smith was close to her fiance’s daughter and the child “idolized” Smith. “The consummate newspaper professional” is how former Capital Gazette features editor Kathy Flynn described Fischman, 61, who was the editorial page editor. “He was famous for working long days and being very precise in his language and always making sure the editorial page reflected the heart of the newspaper,” Gunn said in an interview with The Associated Press. Fischman had worked at the paper for 26 years. John McNamara, 56, who went by “Mac,” will be remembered for his “extensive knowledge of regional sports,” the Baltimore Sun reported. McNamara started at Capital Gazette as a news copy editor, left to pursue sports reporting at the Prince George’s Journal and then was hired back at the Capital Gazette, where he worked for nearly 24 years, the Capital Gazette reported. He will also be remembered for his flexibility and versatility. Gerry Jackson, who hired him back, told the newspaper that McNamara was a “jack of all trades” who could write, edit and design pages. A gunman entered an Annapolis building and “targeted” the Capital Gazette office, killing the five employees of the news outlet Thursday afternoon, police said. According to a law enforcement official, the suspected shooter has been identified as Jarrod W. Ramos, The Associated Press reported Thursday night. The gunman entered the first floor of the building at 888 Bestgate Road with a shotgun, Acting Anne Arundel County Police Chief William Krampf said. “He looked for his victims as he walked through the lower level,” Krampf said, but did not say whether the man was targeting specific people at the news outlet. See photos from the scene of the fatal Capital Gazette shooting in Annapolis, Maryland, on Thursday afternoon.